Are you a frequent customer at the Plant Shed? Sign up for our new Rewards Program today and save! 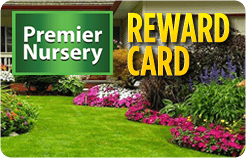 Take advantage of great savings by joining the Plant Shed’s Rewards Program. As a Rewards Member you will enjoy members-only savings, as well as additional Benefits. For Every 1,000 points you will recieve a $50 gift card. Think of your purchases as an investment, and look forward to earning your reward every time you shop. Just fill out the form below and click the submit button.